Thank you for visiting the AMIGOS fundraising page. Your gift to AMIGOS transforms participants, as well as communities. With your support, we can continue to have a positive impact on even more communities as a greater number of young people from diverse backgrounds have life-changing experiences in youth development and leadership. AMIGOS is creating a world in which young people realize their full potential as leaders and global citizens. 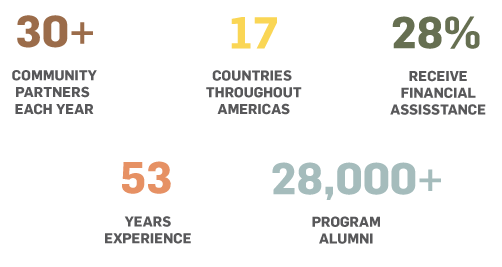 Our participants throughout the Americas gain life experience that empowers and inspires them to drive social change. Donate or become a fundraiser for AMIGOS today. Together, we can impact generations to come. CauseVox is a peer-to-peer fundraising platforms that brings together people - just like you - who are inspired by our mission of building young leaders and supporting AMIGOS! How do I make my own fundraising page? To get started as a fundraiser, just click on the box above that says "Join the Campaign"! It only takes a minute to set up! Can I simply make a donation? Absolutely! The easiest way to make a donation is to click the "Donate" button above! How do I contribute to a specific fundraisers page? Scroll down and you'll see a list of "Fundraisers" - scroll through them to find the fundraising page you're looking for. Click on that page and you'll be able to contribute directly to that fundraiser. All donations are tax deductible and go to Amigos de las Américas (501c3 non-profit).